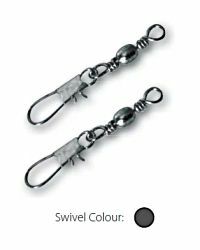 Top quality black barrel swivels from Tsunami Pro with an interlock snap fitting for quick and easy lure changing. Durable, heavy duty construction and top quality and reliability. Perfect for fixing a lure to the fluorocarbon leader. The internlocking snap swivel makes it easy to quickly change lures. More time fishing, so you're less likely to miss that one take when the fish are playing hard to catch.